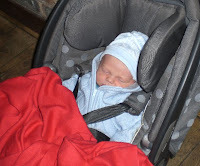 We took our wee boy out for his first restaurant experience last week. I'm not sure he appreciated it, as you can see, he slept through the whole experience, but it was very enjoyable for the rest of us. The restaurant we went to was The Glass House in St Andrews and we will definitely be going back again. The whole meal was delicious, the interior was very sleek and modern, with lots of levels, nooks and crannies and the staff were charming. You can see where this is going, can't you? I knew I was going to have to have that risotto again soon and so I made risotto for dinner last night. I left out the sun-dried tomatoes, as I didn't really appreciate them in this dish and I do think the risotto was better without them. Fry the mushrooms in 1 tbsp olive oil until soft and succulent, before adding the artichoke pieces. In a heavy bottomed pan, saute the onion and garlic in 1 tbsp olive oil until the onion is soft and translucent. Add the rice and mix through until well coated with the oil. Add a ladleful of hot stock and stir until the liquid is absorbed. Continue in this fashion with the rest of the stock and the wine, until the rice is creamy, but still has a little bite to it. Add the mushrooms and artichokes to the risotto. Season to taste and then add a knob of butter and mix through until the butter has melted. Serve with freshly grated vegetarian parmesan and enjoy. cooper looks so snuggly and warm - very exciting to go to a restaurant as a family with him - and that risotto sounds great - I want to try it. This looks really tasty. I love mushroom risotto, and adding artichokes sounds fabulous. Sun dried tomatoes don't seem right though, your version looks much nicer! Cooper looks so snuggly in that hat, so cute! Cooper is such a sweetie! Mmm, artichokes and risotto - two of my favourites! There is always, always a need for another spoonful. Also, I'm really happy you said this worked well without the sun-dried tomato, as my mum is allergic but we both adore artichokes. And mushrooms. And risotto. So thank you for the lovely-looking recipe! Your bub is just so cute! Thankgoodness he slept and didnt scream haha i always feel sorry for parents whose kids start screaming in the middle of an outing. The risotto looks great! I might have to keep this recipe in mind. Ive tried to recreate recipes from restaurants many times and i can never seem to get it quite the same. I think Cooper was appreciating the expereince Jacqueline. He decided he would go to sleep and let mummy and daddy enjoy their meal. What a treasure he is for being so considerate, don't you think. I've never been to St Andrews, worth a visit one-day, but not for the golf. Artichokes in risotto, now I haven't tried that one. Sounds good. Wait till he starts walking - it wont b so enjoyable then!!! I so love good risotto's & this is one great one!! Artichoke, mushrooms and cheese...can't top that one. Looks great. Glad you were able to get out to a restaurant with the baby. Awe - Cooper looks so sweet! All snug as a bug too. 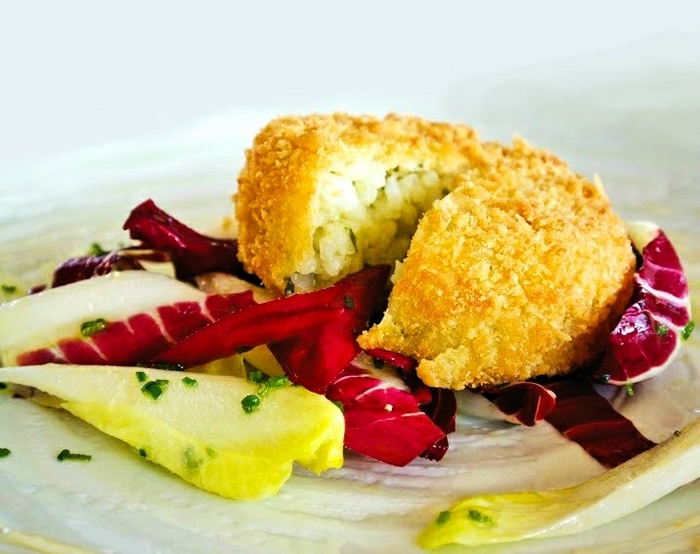 The artichoke antipasti adds that extra dimension here J. I just love risotto and have one planned soon! Don't you love finding great new restaurants? Cooper is so darn cute!! 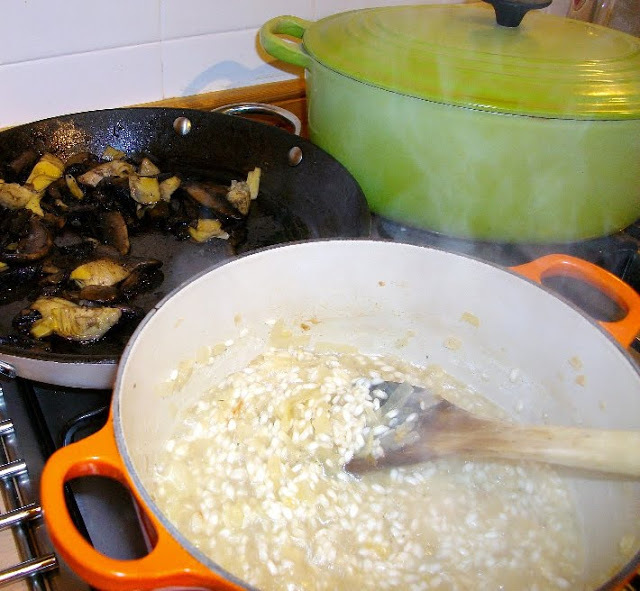 The risotto looks creamy and delicious - I love artichokes and mushrooms. wow I love mushroom risotto, and adding artichokes sounds fabulous. Sun dried tomatoes don't seem right though, your version looks much nicer! And... "baked field mushroom topped with garlic butter, grilled goats cheese and a parmesan and herb crumb"... sweet mother of mercy that sounds heavenly!! I love it when I get inspired by something in a restaurant and can cook a better version of it at home! And Cooper's going to be a right little foodie when he grows up, isn't he?! Hi SJ, artichokes are more and more becoming a favourite of mine. I think he is very considerate Mangocheeks. You really must plan a day trip to St Andrews, it is a wonderful place filled with lots of lovely independent shops, cafes, a great kitchenware shop, not to mention the lovely architecture and cobbled streets. Thanks for that Beth, LOL! Thanks Sophie, I think so too! He was cosy Chele, but he hates getting into that car seat! It is well finished Soma, but if you are ever over this way, I will cook it for you! wow I love mushroom risotto. I love mushroom risotto, and adding artichokes sounds fabulous. Sun dried tomatoes don't seem right though, your version looks much nicer! This looks really tasty. Thank goodness he slept and didn't scream ha ha I always feel sorry for parents whose kids start screaming in the middle of an outing. It will depend upon the flavors in the risotto, but I can't see why they wouldn't, unless of course you had some unusual flavours.